I use Rem or Win brass and FL resize, primer is any basic (Boxer) Large Rifle Primer. HDY 150gr #3037 FMJBT (With cannelure) seated in proper alignment with the cannelure. This is my source for Garand Enbloc Clips. This is a very satisfactory Repro Garand Rifle Belt. [HR][/HR]30-06, have no idea, 6.5-06 is where it's at. Sorry here, just making 1st post, carry on. [HR][/HR]I tested another load today. This time with 168 SMK, and 168 Barnes TTSX. Both loads shot sub MOA out of my stock Savage 111 hunter. No velocity numbers at this time. Will test when I get a chance. JGlasgow wrote: I tested another load today. This time with 168 SMK, and 168 Barnes TTSX. This load was recommended to me (168SMK) on the old site. I loaded up a bunch with 168SMK and 165SGK today, Will test tomorrow in my older M70 sporter and brand new Axis II XP. PS This load proved outstanding in my M70 Sporter/light tactical rifle; three rounds into 2" at 250yd off a sandbag/bench. I have also loaded the same components, substituting the 165SGK, will test as time permits. Finally had a good shooting day yesterday (Saturday), and rezeroed with the 165SGK load at 200yd. This is a very good load, at least as accurate as the 168SMK load. Went back Tuesday and shot the 168gr SMK and 165gr SGK loads side by side. The SMK load patterned its five-group (very) slightly tighter and slightly higher and righter (within 2" each at 200) than the SGK load, which, while significant, is well within acceptable standards, especially since the POI shift is consistent and predictable. My Weaver Classic V-16 allows this to be visible and adaptable at 200yd on Shoot-n-See type targets. [HR][/HR]178 A-max/Lapua Brass/56.2gr H4350/Fed210 Primer good for 2700fps. Went to book max 57.5 with no pressure but inconsistent results. Settled at lower node with decent velocity and hopefully nice long brass life. BTW I have noticed that the Sierra load manual states H4831SC as accuracy load for the 30-06 and 150/155gr bullet. I have found the Sierra accuracy loads to be on point with some other cartridges but have never found anything of the sort listed across the internet. Anyone ever give this combination a shot? 56.5 IMR 4350 3.35 oal 178 amax 2770 fps. [HR][/HR]Any data with the 215 hybrid? Any data with the 215 hybrid? Speed 2810avg. with great ES. I have shot this to 730 yards and will hold half moa. [HR][/HR]Isn't Re17 a little fast for such a heavy bullet in .30-06? Isn't Re17 a little fast for such a heavy bullet in .30-06? There is some guys over on LRH getting some amazing velocities with 17 and the 215 hybrid and the 208 Amax. [HR][/HR]Looking for a starting point for H4350 and 185gr Berger VLD Hunting. [HR][/HR]200grn smk 52grns imr 4350 fed brass fed 215 match primer 3.34 oal. I thought that was in the .308 Win. Either way, I am trying both the 208 A-Max and 215 Hybrid so I'm interested in your results. [HR][/HR]There's a guy getting 2700fps with a moly 208grn Amax with RL 17 out of a 20 IN. Barrel 30-06!!!! [HR][/HR]Followup on the 168SMK/165SGK 48.1gr IMR-4064 load as of yesterday, 10/9/14. 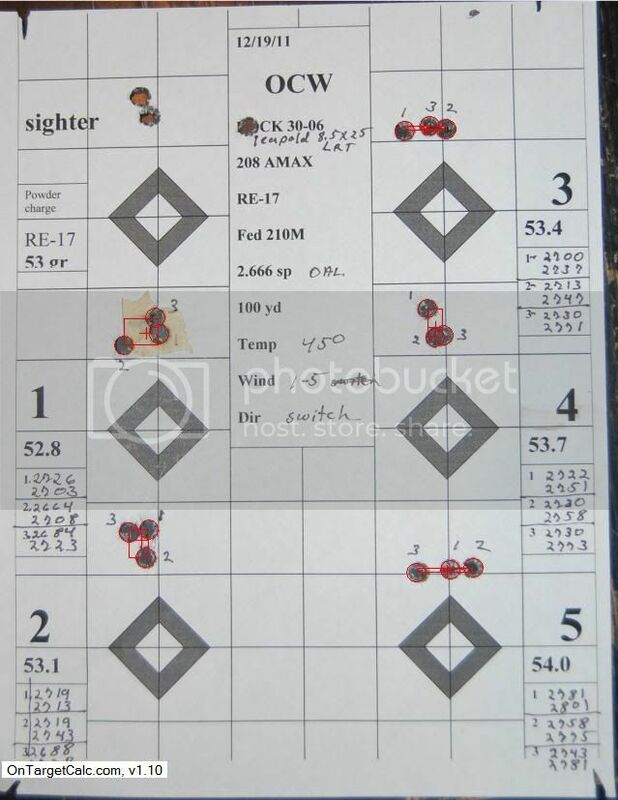 Performed/attempted sight-in with Ruger 77 MK I and Axis II XP. The Ruger is very happy with the load, 200yd sight-in distance prints within a 3" dot, 150yd 1-2" high, 100yd, essentially right on again. The Axis II XP is not liking this load, nor a previous handload, nor Hornady 150gr American Whitetail. Everything is opening up to about 6"-8" at 200yd, and that's not acceptable. I will need to go over the rifle for issues, but that's for the coming Spring; this coming Saturday is Gun Season Opening Day. When I did the initial sight-in, I discovered the ring mounting and clamping screws were mushy tight, and secured them more positively; this could be related the issue. I still got skunked, but at least I got a shot at fast mover. No contact established. Later, saw five deer moving fast at about 200yd in a drive, but had 4 drivers in the brush somewhere behind them, no shot taken. Six hunters/six deer, three of them brown/down by my Son-in-Law. One by 91/30 7.62x54Rwith HDY 150gr SP Interlock 303 handloads, one by M77 MK I 30-06 with 165 SGK handloads, one by Mossie 500 12ga Slug. Both handloads performed quite well, both shots were closer in. [HR][/HR]We went back to the vineyard and hunted the same spot driving to me, as Opening Day last Saturday; and what looked like the same two does popped out of the vines about 50yd away from the last time. Took the same shot as last time; and this time, we connected, but I didn't know that at the time. Deer disappeared into the woods, and I waited the requisite 5 minutes while I went over the area where the deer was when I shot. No hair, no blood were found. I tracked into the disturbed leaves about 50yd, but no hair, no blood anywhere. One of our young hunters RDV'd with me, and he had me stay put and began tracking. About 20yd past where I had stopped he signaled blood. and began a stealthy track. About 60ys further. the blood trail ended and the snow and ruffled leaves got chaotic; after abput 10 minutes wasted trying to pick up more blood we all came back and decided to drive the woods from the opposite end. Toward the end of the drive a small doe popped out and was taken. We went back and redrove the area the small doe came from, found mine, and dispatched same. Dressed out, we went back to the barn, hung and skinned the two doe. Hung, it appears mine was one of the bigger deer taken so far this year, buck or doe. Guys who know more about this estimated her at around 130lb. The shot placement was abaft of ideal. The terminal performance was very good, but nearly all of the blood was internal. We were fortunate to have eventually harvested this doe. But venison is venison, and tracking further, and persisting in the search are the lessons of the day. That's eight deer down and five were finished off by my Son-in-Law, including my doe. Nice, I picked up some 17 and 208's I went as far as 54grs hope I get accuracy. I haven't had a chance to shoot the load workups. Its been cold.. Please note these findings are for my rifle with a muzzle break. Powder: Accurate 2700 @ 52 gr. Bullet: Sierra Matchking. 200 Gr. Barrel: Krieger Barrel 36 w/Vais break. The 52 gr is right at the rifles limit for fps. A few more grains up I started seeing pressure signs on the primers. Also found one just a bit slower for warmer days. Powder: Accurate 2700 @ 51.1 gr. edit: got rid of all the extra spaces. Gotta Love Twain , Mark or Shaniah ! Barrel length and any accuracy tests? [HR][/HR]has anyone tested RL26 yet? I think it'll be pushing it getting 62gr of re26 in the case unless it's a ball powder. Lapua brass cci 200 H4350 53.5gr 3.456" coal (.020" off the lands) 2700fps. 26" barrel, easily 3/8moa with lots of sub 1/4moa 5 shot groups. I'm really surprised someone was able to get 2700fps with a 208 amax using re17 in a 20" barrel. I've tested it before but always got pressure before getting up to speed and the accuracy went to crap. Velocity and accuracy was always better with h4350 or h4831sc. H4350 was just more accurate for me in that rifle. Anyone have any AA4064 loads for a 168gr Barnes TTSX? Got my new 06 being built by Phoenix Custom Rifles, just tagging in here. 5 shots always sub .75 MOA and sometimes considerably lower. No pressure signs on hot days. Developed a few loads for my Tikka T3 Lite in .30-06. 22" Barrel. No case prep. I also shot this load, but cant find any photos...may or may not be a shooter. 55.2 great of Varget. Wow, that is hot. is this your pet load, or Hornady's garand recipe? Where did you get the info? I ask only because I have a bunch of hornady brass and would like to recreate their garand load. Thanks. The M1 Garand load is straight out of the Hornady reloading manual. It works well in my rifle, when I can find Varget. I do also use IMR4064, and either h4895 or IMR4895. My link for the en-bloc clips has gone bad, here's another to the same product. So far, the M-23 Ammo Belt Repro link still works. Settled on 50.5 (over book max) IMR 4064 with zero pressure signs, not even the typical Rem cratered primer. Temperature was 50-60°F. Chronographed over a magnetospeed with Harvester suppressor attached and got 2850fps. Extremely good 3 shot groups at 100. All bullets touching. The rifle never shot terrible throughout the load testing starting at 48.1 and working up in .4 increments. Now to load more and test at longer range. The TTSX bullets are my go to hunting bullets. I've had very good luck with them. RL 16 or RL 23 with ELD 178? 300’ ASL 66F 68% RH, an unusually cool and dry morning for this time of year in Northern Virginia. 10 shot group @ 100yds prone with a bipod on a concrete pad. Initial pressure testing with RL-26. No chrono data today unfortunately. Chamber is PTG 30-06 National Match, .340 neck, .073 FB, 1’-30. Brand new barrel. 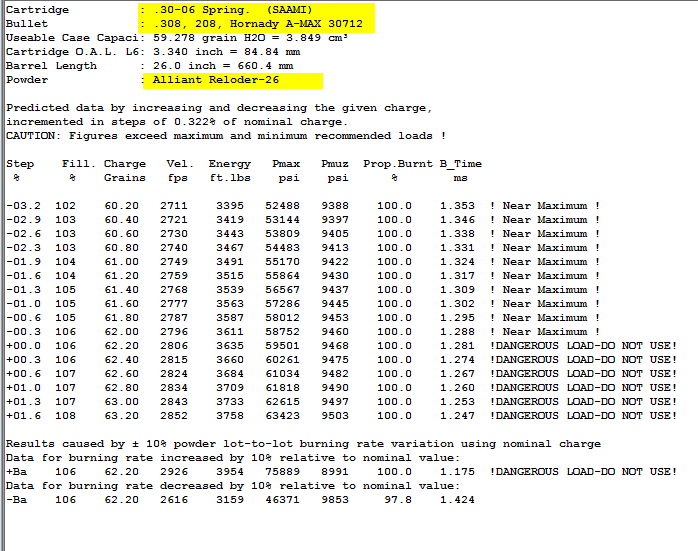 Lapua brass, virgin, CCI 200, went from 59.0gr to 62gr in 0.5gr increments. Tiny bit of primer flow on the 62gr hybrid load, no ejector marks on anything shot today. 50 degrees outside. There’s some funky circular marks on the primer from my bolt face but that’s just the rifle. @Forward543 ’s Quickload max of 62.0gr of RL-26 under the 208gr ELD-M looks safe for my rifle.